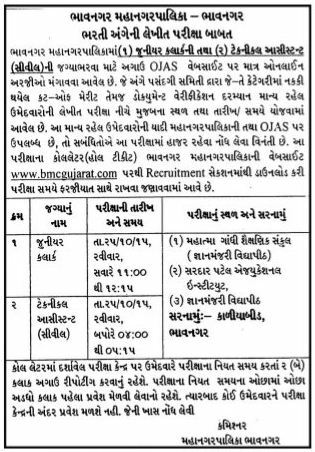 BMC Junior Clerk Technical Assistant Hall Ticket 2015 – Bhavnagar Municipal Corporation has issued Junior Clerk and Technical Assistant Written Exam Hall Ticket. The candidates who selected for this exam can downlaod thier BMC Hall Ticket through official site www.bmcgujarat.com or direct link provided below. Click Here for DOwnload BMC Gujarat Hall Ticket/Call Letter.